The penultimate Leg begins as teams must fly to Edmonton, Alberta. They have US$780 on their BMO World Elite MasterCard. Once in Edmonton, teams must make their way to Edmonton City Hall where they must interrupt a wedding to receive their clue form the justice of the peace. Teams must now head to the Edmonton Waste Management Centre. Despite arriving at City Hall last, Simi & Ope jump into a cab first! 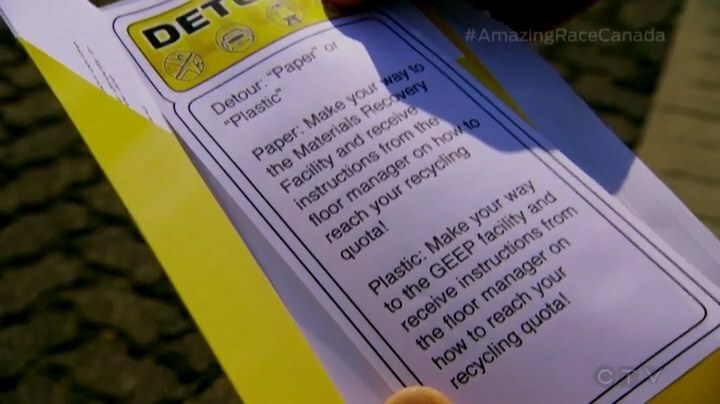 They find the next clue which reveals the Detour: Paper or Plastic. Jon says this is a Blind Detour. 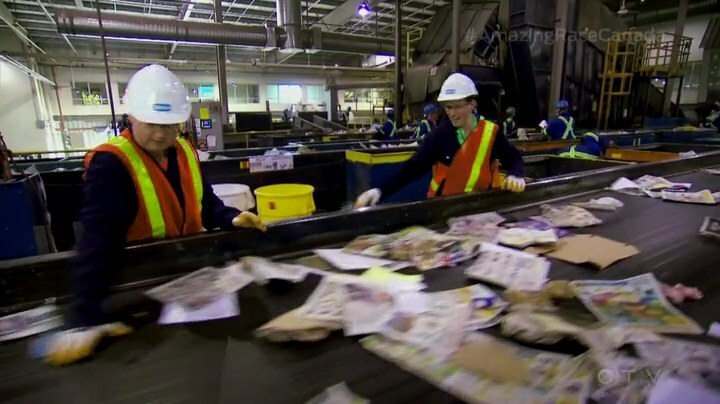 In Paper, teams will head to the Materials Recovery facility where they will sort out non-paper products from the paper line. They must fill two bins, one for plastic and another for non-paper garbage. Once each bin weighs 13 kg, they will receive their next clue. 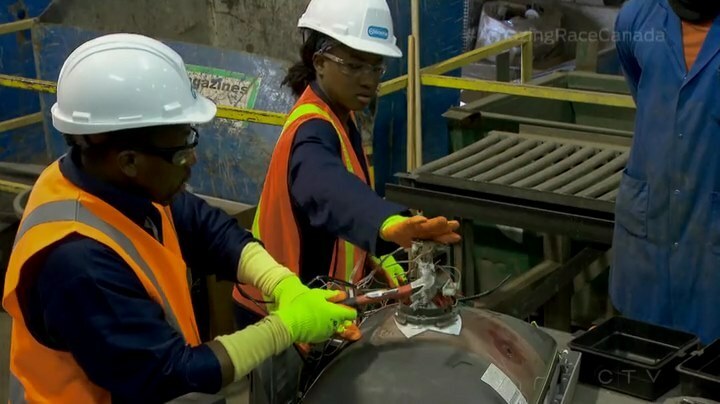 In Plastic, teams will head to the Global Electric and Electronics Processing facility. They will dismantle six dead television sets and carefully separate the specific parts that will be shipped off and safely recycled. If they break any parts, they must grab a new TV. Simi & Ope choose Plastic. The guys arrive and they are shown to ask their taxis to wait. Simi & Ope get started and after a few mistakes in breaking the glass, they get the hang of dismantling. Brent & Sean choose Paper while Gino & Jesse and Nick & Matt also choose Plastic. Brent & Sean finish the Detour first and find a Face Off. Teams must make their way to the Ottewell Curling Club and beat their opponent. Gino & Jesse finish the TVs first followed by Nick & Matt and Simi & Ope. At the entrance, there’s only one taxi left. Gino & Jesse’s taxi did not wait for them. They decide to take Nick & Matt’s. But Nick & Matt arrive just in time to try and get it back. But the driver takes off with Gino & Jesse. Inside, Simi & Ope ask the front desk to call them a cab. The last two teams are waiting. 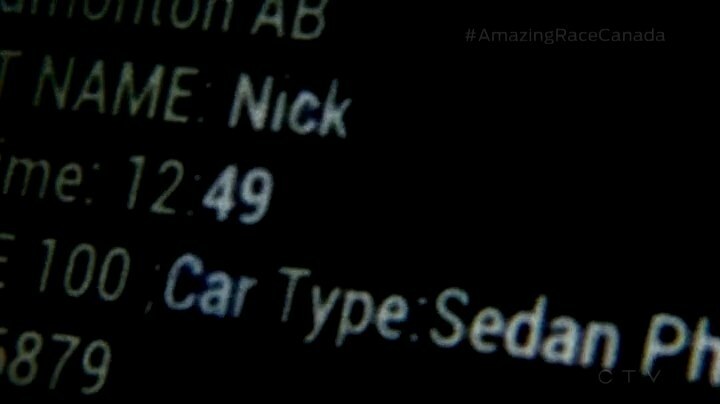 Simi tells Nick & Matt that they’ve called a cab and asks Nick & Matt if they did too. They say yes, but they don’t care to steal it if they can. Brent & Sean arrive at the curling club. For this Face Off, each team member will throw four rocks down the ice aiming for the button. The team that gets their rock closest to the button will win the Face Off. The last team must serve a penalty. Gino & Jesse arrive and the Face Off begins. Brent & Sean’s grandfather played for the Nova Scotia team and get three into the circle. But Gino & Jesse suddenly get one closest to the center. This is now Brent’s opportunity and he manages to knock Gino & Jesse’s stone out. Brent & Sean win the Face Off and leave. Teams must now make their way to a Petro-Canada station in St, Albert and search outside. Back in the middle of nowhere, a taxi arrives and Nick & Matt immediately jump into it. Simi & Ope try asking the driver if they have their names, but Nick pushes them out of the way. The driver takes Nick & Matt. Meanwhile, Brent & Sean arrive at the gas station. 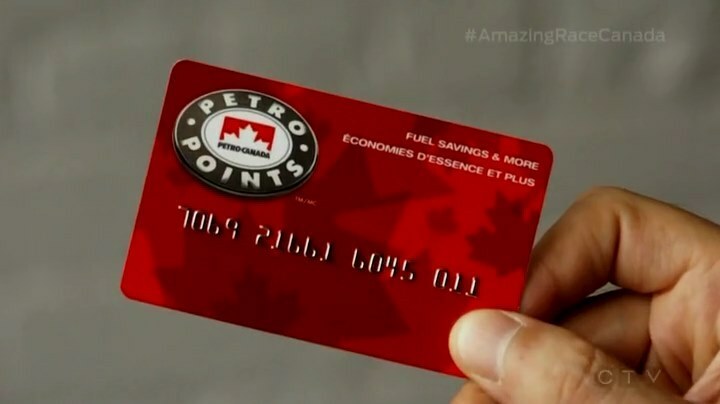 Teams will be given a Petro Points card loaded with 250,000 points. They must use all the points to buy drinks and snacks within 90 seconds. Brent & Sean complete it in one go and they must now find Kelly’s Saloon in Fort Edmonton Park. Simi & Ope finally catch a cab and low and behold, this cab was actually Nick & Matt’s because the driver has their name on it. 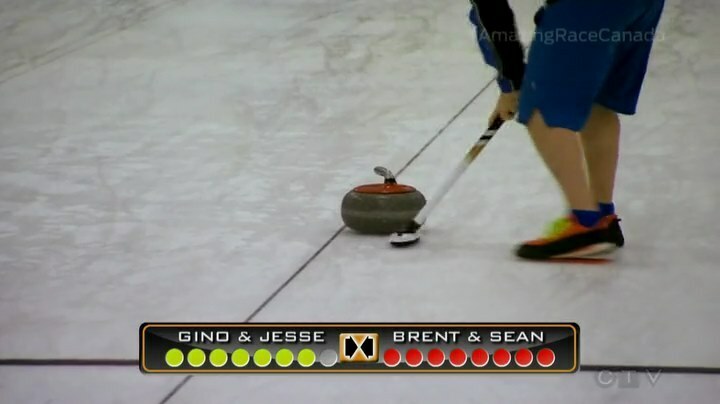 At the Face Off, Nick & Matt angrily call Gino & Jesse out for stealing their cab before they start their match. Nick & Matt manage to win the match and are happy karma has bit Gino & Jesse’s butts for stealing their cab. Brent & Sean find Kelly’s Saloon and find the Road Block: Who wants to raise the bar? Matt, Ope and Brent MUST complete this Road Block. For this Road Block, teams will dress up and memorize a script to take part in a reenactment of a liquor license/licence (Canadian lol) raid. At the curling club, Simi & Ope tell their taxi driver NOT to take anyone else before going inside and seeing Gino & Jesse. 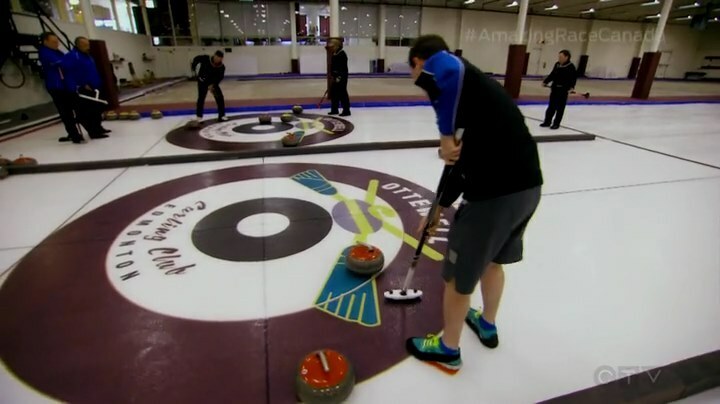 They get started with the Face Off and Simi manages to knock Gino & Jesse’s rock out of the circle and are now in the lead. But Ope knocks their own rock out. Gino & Jesse manage to get their rock right near the middle. Now it’s up to Simi to knock it out. But she doesn’t. Gino & Jesse win the Face Off and Simi & Ope must wait out their penalty. The brothers head outside and steal Simi & Ope’s taxi. At the Road Block, Brent and Matt both fail their first attempts. Back at the curling, Simi & Ope head outside and discover their taxi is gone. They head back inside to ask them to call a cab. Simi is upset, but Ope says it’s okay. They will continue to play clean and fair. Gino & Jesse arrive at the saloon and Jesse decides to do the Road Block. Brent is on his 6th attempt and he finally passes. He and Sean open the next clue telling them to head to the Muttart Conservatory, the Pit Stop for this Leg. The last team to check in WILL be eliminated. Brent & Sean decide to steal one of the waiting cabs, but they say they’ve called another cab that is on its way. Simi & Ope arrive at the saloon and are excited to hopefully get their revenge. At the Pit Stop, Brent & Sean step on the Mat and are officially Team #1. They’ve won a trip to Dubai and 10 million Petro Points they can use for two years of free gas. Ope goes for his first attempt, but he fails. Jesse fails his 2nd. Matt fails his 3rd. But Matt gets it on his 4th attempt and he and Nick head to the Pit Stop as Team #2. Jesse is successful after his 4th attempt and he and Gino leave. Ope is on his 6th attempt and finally gets it. It’s a taxi race to the Pit Stop. But Gino & Jesse arrive to claim the last spot in the Final Leg. Simi & Ope arrive at the Mat and Jon officially checks them in as Team #4. But that means they are eliminated. Jon congratulates them for being immigrants. Well that had to be one of the worst TAR episodes evah! Something that would’ve fit right in with TAR24. Ewe. 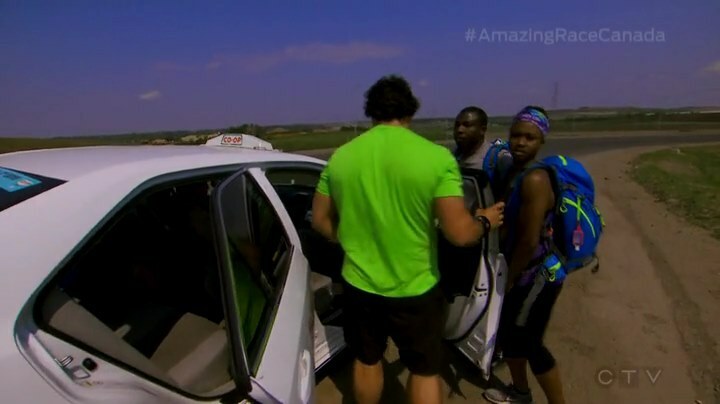 I can’t even comment on the tasks or Leg design because this taxi stealing has got to be some of the worst behavior I’ve ever seen on TAR. It’s bad enough when a team does it once. A team. And it might happen once every couple of seasons. But we got three teams doing it multiple times in one Leg! WTF?! The taxi drivers were no better either. Very unprofessional. How about we get Uber to partner with TAR instead. Like seriously, this was so ugly. I just realized how Derek Ramsay actually called teams out on TARPH2 for horrible sportsmanship and disrespecting the Race. Here, Jon actually applauded the teams for their dirty gameplay and even said “All is fair… on the Race.” WTF?! All is NOT fair on the Race. Wow. Anyway. It all started out fun with interrupting the wedding. The Detour was okay, though very obvious how it was a task that could only be done on a mostly-Canadian route. Curling is great. But a Face Off on the penultimate Leg? That’s so stupid. What a dumb decision. After seeing the failure of the first Face Off, TARC should’ve decided to cancel this one or find something else to do in an earlier Leg. The Face Off, as executed by TAR Canada, is bad enough on its own. But putting one in the penultimate Leg? Wow. The Road Block was just okay. Overall, it was a pretty bland design for a penultimate Leg. And then we’ve got Taxigate to make it all worse. TAR Canada has been solid, but they’ve got a lot of things to correct going into season 4. I guess I’ll go into it a little more in my finale thoughts next week. I was expecting Simi & Ope to get eliminated in 4th. The good ones always do. (Hello Sukhi & Jinder!) But the way they got eliminated with all that taxi crap made it worse. They definitely deserved to make it to the Final Leg and even win it all. They’ve fought hard, they never quit (except for not wanting to get hypothermia from the stupid Face Off) and have always managed to step it up when they needed to. Definitely a lot of heart from them and they definitely deserve an All-Stars slot in the future. Brent & Sean have been mostly okay this Race with some great, hilarious moments. They’ve Raced well. And of the three teams, I guess I would prefer them to win though I’m not really that excited. I do want them to win most just to see Sean tumble and roll to the Finish Line and then throw up at Jon’s feet. That would be an epic finish. Gino & Jesse and Nick & Matt though. Wow. I’ve never seen such dirty Racing on TAR before. Brent & Sean also stole a cab, but at the very least, they did call for another one to replace it. Gino & Jesse and Nick & Matt, however, wow. Nick & Matt are much worse though. Not only were they huge hypocrites, but they were pretty nasty and aggressive about it the entire Leg. They physically tried to stop Simi & Ope from talking to the taxi driver. And then they had the nerve to still be angry at Gino & Jesse? That’s absurd. Gino & Jesse have also been hypocrites about their Racing as well. And coincidentally, also involves Simi & Ope. 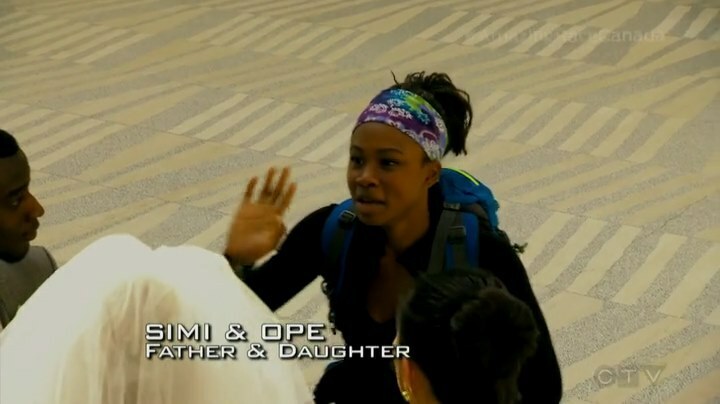 In India, they criticized Simi & Ope for following them to a Route Marker. Then later, what do Gino & Jesse do? Follow Nick & Matt to a Route Marker. That’s definitely not against the rules. But don’t criticize others for doing something you do as well. That’s called being a hypocrite. Wow. How one TAR episode and Leg can change your opinion on a team. It only takes one dirty move, after all.